Dual Gold herbicide from Syngenta is an ideal resistance management tool in the control of annual ryegrass (ARG), annual grasses and broadleaf weeds in a wide range of winter and summer crops, such as sweet corn, sunflowers, wheat, barley, oats, canola, maize, cotton, pastures and concep II treated sorghum. 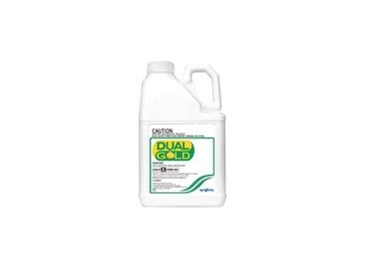 Dual Gold herbicide is a short residual, pre-emergent herbicide for the control of many important annual grasses and broadleaf weeds in nominated crops. These nominated crops include: navy beans, maize, sweet corn, certain pastures, broccoli, brussels sprouts, cabbages, cauliflower, canola, cotton, green beans, peanuts, soybeans, sunflowers, sorghum treated with concep II sorghum seed safener, sweet potatoes, tobacco, wheat, barley, oats and triticale. contains super-active S-metolachlor isomer for stronger, hard hitting control of difficult annual grasses.